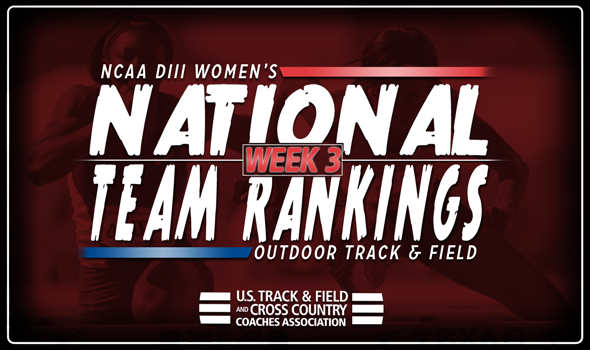 NEW ORLEANS – The only teams that remained in the same spot in the NCAA Division III Women’s Outdoor Track & Field National Team Rankings between Week 2 and Week 3 were No. 1 Williams and No. 6 Emory. Otherwise, it was complete chaos in the most recent rankings released on Tuesday by the U.S. Track & Field and Cross Country Coaches Association (USTFCCCA). George Fox and Claremont-Mudd-Scripps swapped spots behind the Ephs as the former went from No. 3 to No. 2 and the latter from No. 2 to No. 3. UW-Eau Claire was the biggest mover in the top-10 this week as it jumped nine spots from No. 13 to No. 4. The Blugolds haven’t been ranked this high outdoors since 2015. Sarah Glidden and the 4×400 relay team paced UW-Eau Claire as Glidden moved up to No. 3 in the USTFCCCA Individual Rankings in the 400 hurdles and the relay squad posted the fifth best time in the nation this season. Whitworth climbed two spots from No. 7 to No. 5. This is the first time the Pirates have been in the top-5 since 2011. Kayla Leland had a big weekend for Whitworth as she is now ranked fourth in the USTFCCCA Individual Rankings in the steeplechase. Nebraska Wesleyan was the only other addition to the top-10, coming in at No. 9. The Prairie Wolves notched the seventh fastest time in the 4×400 relay this season to aide their cause. The notable jumps outside of the top-10 were made by SUNY Geneseo and Brockport. The Knights saw their 4×100 relay team record the third fastest time in the nation this past weekend. Then it was Victorie Kothor who propelled the Golden Eagles with her nation-leading mark of 15.76m (51-8½) in the shot put. Be sure to check back throughout the season as the National Team Rankings continue to evolve ahead of the 2018 NCAA Division III Outdoor Track & Field Championships held May 24-26 in La Crosse, Wisconsin.